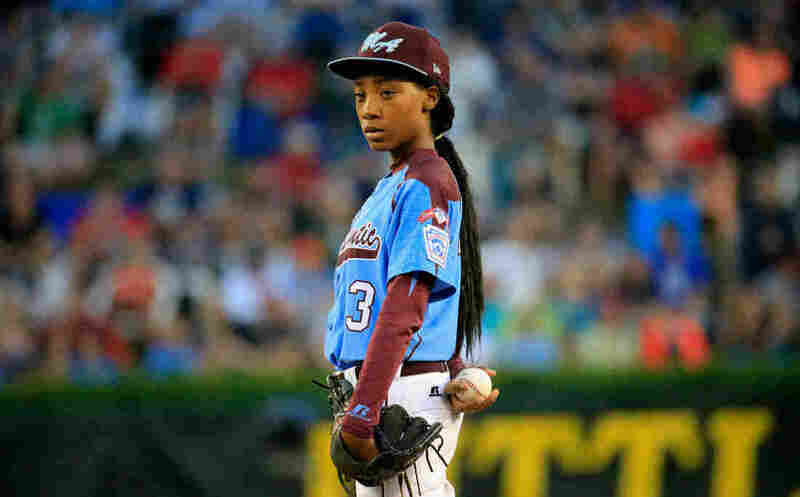 Book News: Mo'ne Davis Steps From The Pitcher's Mound Into Memoir : The Two-Way The teen pitcher, who made history at the Little League World Series, will tell her story in a book to be released in March. Also: R.A. Montgomery, an innovator in interactive reading, dies at age 78. Poised atop the pitcher's mound, Mo'ne Davis was all but unhittable for much of this summer. Dealing a 70 mph fastball that belied her age, Davis became the first female pitcher in Little League history to toss a postseason shutout — and quickly caught the media's eye. Since the start of her remarkable run, she has graced a Sports Illustrated cover and even starred in a commercial shot by Spike Lee. Now, she'll be telling her own story in text. Her memoir, Mo'ne Davis: Remember My Name, will be released in March, The Associated Press reports. "I'm just a girl that likes to play sports and I'm excited to share my story with everyone," Davis said in a statement. "I hope it encourages people to take a chance and play the sports they want to play and not just the ones people expect them to play." At The Adventure's End: R.A. Montgomery, the author and publisher behind the popular children's series Choose Your Own Adventure, has died at the age of 78. Montgomery's life and career centered on finding new methods in education, experimenting with his curriculum as founder of the Waitsfield Summer School and working with the Peace Corps to develop programs in West Africa. "Montgomery who was passionate about education all his life, believed that interactive fiction was critical to reluctant readers in achieving reading fluency," reads a statement on the Choose Your Own Adventure website. But it was Montgomery's work in publishing that brought his words into millions of homes. Launched in 1979, the interactive Choose Your Own Adventure series eventually featured more than 230 titles. Montgomery wrote many of them, but the series brought in other authors, too, including former National Book Award finalist Laban Carrick Hill and Ed Packard, whose book Sugarcane Island prompted Montgomery to start the series. In a conversation with NPR's Talk of the Nation in 2010, Packard reflected on the series' start. "Ray Montgomery found the agent, who found Bantam, who brought out the series in such a big way," he said. "The books became so popular so fast that many more books were needed for the market than either of us could write." Choose Your Own Adventure has gone on to sell more than 250 million copies worldwide, according to the series' website. His final book is Gus vs. the Robot King, a new entry in the series published this year. Community Post: Dan Harmon, the showrunner of the TV show Community and idol to an expansive Internet cult following, will test the waters with his first collection of essays. Entertainment Weekly reports that the book remains untitled but is scheduled for publication in 2016. On Awards And Ambivalence: When Celeste Ng's novel Everything I Never Told You won Amazon book of the year, she admits that while it was "a huge self-esteem boost," the news didn't come without some doubts. "It's hard to feel like the things Amazon was doing were not going to harm the industry," Ng tells The Guardian in a profile published Monday. "I know many people have reasonable questions about how Amazon operates. But the editorial staff, I think, are people who just really love books and want to promote them. They're not the people setting company policy." In The Unspeakable, Meghan Daum pulls together 10 personal essays ranging from marriage to the meaning of being part of Generation X. And after a terrible illness, Daum also questions the grand transformations expected of the near-death survivor. "I'll probably go back to my shallow, whiny ways. And that's actually recovery, though, right? That actually is a success, I think," she told NPR's Arun Rath. "It was as if [people] couldn't believe that I had actually recovered unless I was transformed in some way." The life of James Laughlin gets treated to a biography in Literchoor Is My Beat, a book from Ian S. MacNiven. Laughlin, the founder of the publishing imprint New Directions, brought some of the best literature of his era to American audiences — from Ezra Pound to Jorge Luis Borges. But MacNiven shuffles off those immortal names to probe the doubts and complexities of the publisher behind them. The National Book Awards will be announced at a New York City gala Wednesday. Shortlists for the four categories — fiction, nonfiction, poetry and young people's literature — were announced on Morning Edition in October, and they feature an eclectic mix of titles. Before the awards are announced, acquaint yourself with each of the 20 total nominees found here. The Miami Book Fair International has entered its third decade. Although it technically opened Sunday night, the fair will launch in full on Friday, when its street fair begins — and when PBS commences its "Olympic-style" streaming coverage of the event. The fair is expected to feature more than 450 authors, more than 250 publishers and booksellers and hundreds of thousands of readers from around the world.